When you think of Solar Power you usually think of photovoltaic panels. However there is an alternative method to generate electricity from sunlight which has even greater potential. These Concentrated Solar Power (CSP) systems use mirrors (called heliostats) to direct a concentrated large area of sunlight, onto a small area. Electrical power is produced when the concentrated light is converted to heat, which drives a steam turbine connected to an electrical power generator. Such a project is in the final stages of construction right here in our own Southern California area. The Ivanpah Solar Thermal Project is located adjacent to Interstate 15 at Ivanpah Dry Lake, California. 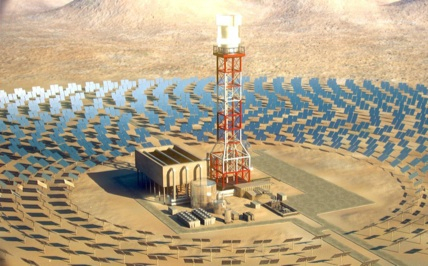 The Ivanpah project is comprised of three new solar thermal power towers which generate steam for three 110 Mega watt (MW) to 126 MW steam turbine generators. Each over 400-foot tall solar power tower will receive solar energy from approximately 60,000 heliostats. The Ivanpah project is anticipated to be the largest solar thermal installation in the world at the time of completion. Ivanpah will produce electricity the same way that most of the world’s electricity is produced – by creating high temperature steam to turn a conventional turbine. However, instead of burning fossil fuels to create the steam, it uses the clean and infinite sun as fuel. At the heart of BrightSource’s proprietary power-tower solar thermal system is an innovative solar field design, optimization software and a control system that allow for the creation of high temperature steam. At Ivanpah, over 300,000 software-controlled mirrors will track the sun in two dimensions and reflect the sunlight to boilers that sit atop three 459 foot tall towers. When the concentrated sunlight strikes the boilers’ pipes, it heats the water to create superheated steam. This high-temperature steam is then piped from the boiler to a standard turbine where electricity is generated. From there, transmission lines will carry the power to homes and businesses. Solar-thermal power stations have several advantages over solar-photovoltaic projects. They are typically built on a much larger scale, and historically their costs have been much lower. Compared with other renewable sources of energy, they are probably best able to match a utility’s electrical load, says Nathaniel Bullard of New Energy Finance, a research firm. “They work best when it is hottest and demand is greatest”. Besides these benefits, the main drivers for the growth of the solar-thermal industry are moves to limit carbon-dioxide emissions and requirements to increase the proportion of electricity produced from renewable sources. According to New Energy Finance, about 12 Giga watts (GW) of concentrating solar-thermal power capacity is being planned worldwide—a vast amount, given that only about 500 megawatts (MW) of such capacity has been built to date. To maximize the energy that can be collected from the sun, solar-power facilities are being constructed in regions that enjoy daily uninterrupted sunshine for much of the year. According to Mark Mehos of America’s National Renewable Energy Laboratory, solar-thermal power could in theory generate 11,000 GW in America’s South-West. That is about ten times America’s entire existing power-generation capacity. Nothing in human history has been more transformative than electricity. Thomas Edison patented the light bulb in 1879. Just a half-century later, President Franklin Roosevelt declared electricity a necessity, not a luxury. And in 2012, the National Academy of Engineering named electrification the greatest engineering achievement of the 20th century. The EIA Outlook projects that the aggregate fossil fuel share of U.S. total energy use will fall from 83% in 2010 to 77% in 2035, while over the same period generation from renewable sources will grow by 77%, raising their share of total generation from 10% in 2010 to 15% in 2035. Join one of our most notable First Ladies, Eleanor Roosevelt and 1930′s journalist Lorena Hickock in a fascinating tea time interview as the two women discuss their perspectives on political and cultural life during the Great Depression. Annette Hubbell stars as Eleanor and Elaine Litton as Lorena. Writer/Director Sherri Colborun and cast will meet with the audience following this informative and entertaining production. These tax breaks need to be stopped!!!! Please sign the petition telling Congress it’s time to end tax loopholes for corporations and the wealthy. Click here to sign. Despite Facebook reporting profits of over $1.1 billion in 2012, the company is expected to pay no federal or state income taxes. In fact, Facebook will receive net tax refunds totaling $429 million, because tax deductions on executive stock options can be written off as salary deductions. Less than a week after the sequester has officially gone into effect, bringing with it painful budget cuts, layoffs, and furloughs for employees, this is a perfect example of how the deficit and spending cuts are driven by loopholes that allow corporations and wealthy Americans to get all the breaks. Congress desperately needs to reform the tax code so that the most successful among us pay their fair share. Please, click here to sign the petition telling Congress it’s time to end tax loopholes for corporations and the wealthy. This month’s monthly club meeting will host an interesting guest speaker, Rochelle Becker, who has been active on nuclear issues in California for 39 years. She co-founded the Alliance for Nuclear Responsibility in 2005 to focus on her experience working with elected representatives and oversight agencies – both state and federal. Featuring the best of border cinema, the Trans-Border Institute will showcase documentary and fiction films offering attendees a broad vision of border culture. Monday, March 4 at 6 p.m.
A documentary film chronicling the life of a leader of a human smuggling network in Tijuana. Director Adriana Trujillo will attend and offer insight into the making of the film. Tuesday, March 5 at 6 p.m.
Lazaro (Kuno Becker) is kidnapped and thrown into a 3 x 1.50 square meter room completely isolated from the outside world. Richness of Internal Space is a testimony of a man’s will to live and his unbreakable spirit. Based on true events. Followed by a discussion with TBI’s security and rule of law coordinator Octavio Rodriguez and Criminal Defense attorney Janice Deaton. Wednesday, March 6 at 6 p.m.
By custom, thousands of artisans in Mexico still use lead based glazes in their pottery without knowing the damage that this toxic element causes to their health. Followed by a discussion with filmmaker Omar Foglio, co-director Jose Luis Figueroa, and visual artist Misael Diaz, who will offer insight into the making of the film. Four Mexican-American teens (13-15 years old) created a video framed to study “participatory culture” in media with themes of social justice in low income communities. Followed by a discussion with video workshop instructor David Gonzalez, and students Jovie Cerda, Jose Gomez and Manuel Gomez. Thursday, March 7 at 6:45 p.m.
A short film about resilience and hope through the eyes of a young boy who has to grow up fast when he learns the value of a dollar. 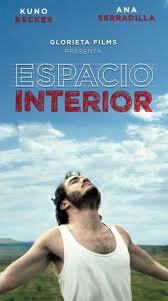 Followed by Q&A with Actor Jose Yenque, who will offer insight on the film. Thursday, March 7 at 7:45 p.m.
social and financial context where the band is born and developed. Friday, March 8 at 6 p.m.
A stifled, small-town young man stuck in a dead end life, runs away to Mexico to be a mariachi singer. MARIACHI GRINGO is a musical tour-de-force exploring the reality of “following your dreams” across cultural, personal, social and geographical borders. The event will follow with a reception and a concert by the USD Mariachi Ensemble, under direction of Serafin Paredes. Click here to RSVP for any of the featured films.